Musselburgh got back to winning ways in Baillie Gifford East One on Saturday, their bowlers putting in a cracking performance to defeat leaders Kelso. The East Lothian side made a good start to the season before heavy defeats to Dunnikier and Gala threatened to derail their bid for top spot. However, they bounced back in some style at Lewisvale at the weekend. Once again Hemant Verma, who now has 25 league wickets to his name in 2015, was the main man. He took four wickets and was well backed up by the rest of the bowling attack as they put Kelso under a lot of pressure. The Borderers could only make 115 and then the Musselburgh batsman dug in well to reach their victory target with four wickets remaining in the 39th over. The win leaves Musselburgh in third while, in a derby, Edinburgh South got the better of Heriot’s II. At Golddenacre, Heriot’s batted pretty well to make 184 all out, but Edinburgh South easily reached their victory target with five wickets in hand. Cheslyn Clark made 62 not out, Matthew Chapman scored 46 and Charanjit Singh chipped in with 38 for the victors. Edinburgh Accies travelled to the Borders and were in ruthless form to defeat St Boswells by 10 wickets. 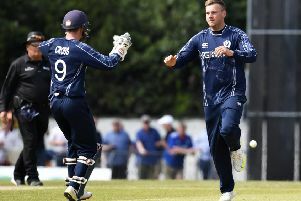 West Lothian defeated Watsonians II at Craiglockhart while Dunnikier beat second placed Gala to open up the title race. In East Two Ed Pickmere took 4-6 for SMRH II as they defeated Broomhall comfortably.